This year, the celebrated perfume house Molinard will celebrate 160 years of perfume production. Founded in 1849 in Grasse in Provence, France; Molinard remains to this day France's oldest entirely family-run business. Known in over 40 countries internationally for their vast history and well-crafted perfume portfolio, Molinard have enjoyed many successes spanning the decades, including the ever-popular and completely bewitching Habanita (1921) which is a cherished scent that is still in production today. In years gone by, this house has presented their enchanting aromas in opulent Lalique glass and Baccarat crystal flacons... an indicator that their olfactory artistry deserves to be treasured and revered. On a recent visit to Vienna I was introduced to a number of perfumes from the Molinard line. As has now become tradition on any trip abroad, I look forward to the opportunity to purchase and wear one brand new scent for the duration of my visit, so that memories of my stay will easily be conjured at a later date with one single sniff from the bottle. In Austria I visited countless perfumeries and grew tired of the same offerings from store to store... that is, until I stumbled upon the Molinard Pour Homme series. 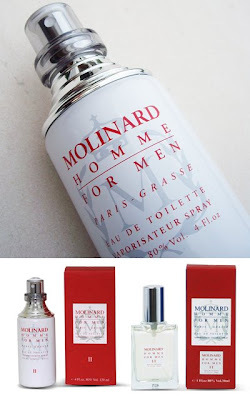 Presented as a trio of scents packaged in stylish flacons as white as a sugared almonds, I sampled the line and fell instantly for Molinard Pour Homme II. Pour Homme II is a sensual woody fragrance that evokes a feeling of immediate presence... bold, polished and assertive. A delicate balance of Sicilian mandarin, and juniper provide an aromatic opening top note, however one can instantly recognise fragrant cedar and bourbon vanilla being at the heart of this scent. It represents an interesting paradox... MPHII is thick with lush accords of Brazilian orange and Crimean coriander; yet somehow husky and arid - displaying deep pastel tones of patchouli from Singapore, vetiver, and dry hay from La Crau. As the scent dries down, the vanilla takes a step to the side, and the richer woody/patchouli notes come to the fore. If I were to liken it in style to an existing release, I would suggest that this offering is parallel to Yves Saint Laurent's Kouros, though completely devoid of the civety, animalic accords that render Kouros a 'love it or hate it' cologne. It does have a pronounced 'dustiness' though, that is akin to the YSL release. I can also see Pour Homme II as quite possibly being the inspiration behind Gaultier's Fleur du Male - though again, without the somewhat thick, disorienting, almost animalic orange blossom. With the scents from the Molinard Pour Homme line, exceptionally good value for money can be found. PHII is a wisely constructed fragrance that draws upon the company's 160 year-old perfume narrative, and translates it into a vernacular still very valid and relevant today.